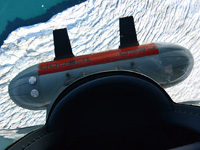 The Polar Geophysics Group (PGG) is involved in airborne geophysical campaigns at both poles in collaboration with the National Science Foundation, NASA , the New York Air National Guard, and several international partners. Radar, lidar, gravity and magnetic data are used to explore ice sheet morphology and processes as well as the geological setting of these regions. Research interests within the group encompass a spectrum of instrument development, fundamental mapping and the development of models. Processes under study include subglacial geology and hydrology, ice dynamics, and surface mass balance.